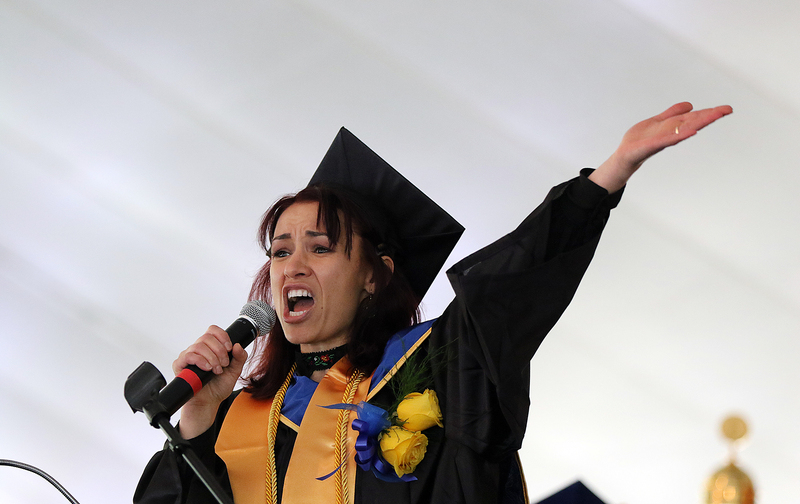 Engineering major Malina Popa was the student speaker at the 2018 Commencement. One of the highlights of commencement each year is the speech by a graduating student who has been selected by faculty and staff to represent the class. The college is now soliciting nominations for the 2019 student commencement speaker and anyone interested is invited to nominate an outstanding student by Tuesday, April 2. To be considered students must be graduating with a grade point average of 3.5 or above. In addition to academic success, contributions to the college and/or the community in general will be considered. The information you submit as well as official transcripts will be considered by a committee of faculty and staff who will make recommendations to President Glenn. This is a very competitive process so please be sure that the materials you provide reflect the full scope of the individual you are recommending and clearly communicate why this person should be selected to represent the class of 2019. To learn more about NECC’s Commencement, which will be held on Saturday, May 18 on the Haverhill Campus, visit the website. If you have questions, please feel free to contact Ernie Greenslade, Marketing Communications, at 978 556-3862 or egreenslade@necc.mass.edu.